Follow along with the flight of Falcon 1, the SSEP Mission 3a payload of student experiments. The SSEP Falcon I payload of 7 experiments arrived on the International Space Station (ISS) at 8:45 am ET, September 29, 2013. Falcon I was ferried to ISS on the historic first flight of the Orbital Sciences Cygnus spacecraft. With SpaceX Dragon, Cygnus is now the second commercial vehicle to dock with ISS. Cygnus lifted off on an Antares rocket as the Orb-D1 mission, at 10:58 am, September 18, 2013, from the Mid-Atlantic Regional Spaceport (MARS), Pad 0B, Wallops Island, Virginia. The 7 remarkable Falcon I student flight experiment teams, their communities, descriptions of their experiments, and video clips of team presentations at the 2013 SSEP National Conference at the Smithsonian were detailed in a September 17, 2013 blog post. We are now nearing the end of on-orbit operations for Falcon I, and are now at T minus 10 days from de-orbit on Soyuz 35S (see the Mission 3 countdown clock in the right column). 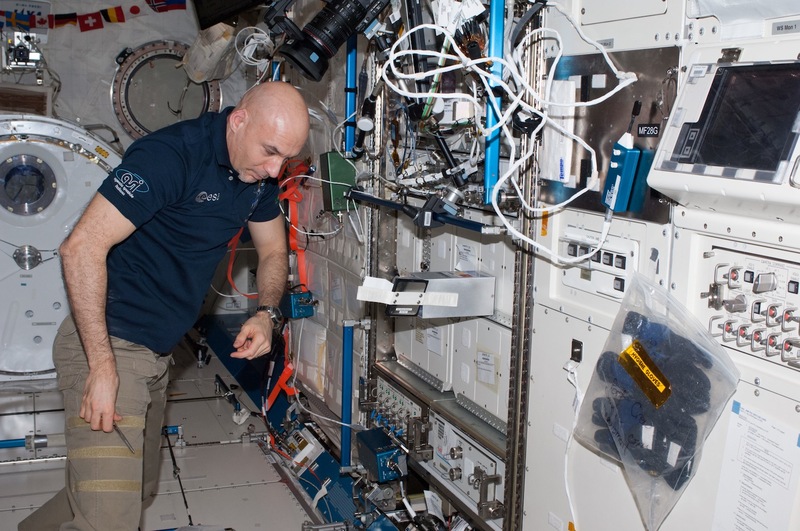 Since arrival on ISS a month ago, European Space Agency (ESA) astronaut Luca Parmitano has been operating the experiments as per the protocols defined by the student flight teams. At the same time on the ground, flight teams have been conducting their identical ground truth experiments, mirroring all on-orbit operations. Activities on orbit are relayed to Earth by Luca to NASA’s Marshall Space Flight Center. This information is then communicated to NASA’s Johnson Space Center, then to NanoRacks, and then to the National Center for Earth and Space Science Education (NCESSE). NCESSE then communicates this vital information to the student flight teams, in support of their ground truth operations, via the official SSEP Mission 3 to ISS: Experiment Log page. You’re invited to visit this page to see how on-orbit operations with Falcon I are reported out to the student flight teams in real time. On-orbit operations to date included activation of 2 experiments on September 30 (Pennsauken, NJ; and Russell County, VA); activation of 1 experiment on October 2 (San Marino, CA #1); and activation of 3 experiments three days ago on Monday, October 28 (Alpine, NJ; Willis, TX; and San Marino, CA #2). The final experiment activation (Howard County, MD) is scheduled for tomorrow, Friday, November 1, 2013, by American Astronaut Karen Nyberg. Science Status: Luca Parmitano performed operations on three of the mixture tubes from NanoRacks Module 9 S/N 1007. The operations occurred at 06:37 AM CDT. Science Look Ahead: The next crew interaction will be on GMT 305 (November 1). Stick 2 will be activated by Karen Nyberg. SSEP Look Ahead: NanoRacks is now gearing up for de-orbit of the Falcon I payload of experiments, with Soyuz 35S landing in Kazakhstan in 10 days (we will provide live coverage at this website). The payload will be flown back to Johnson Space Center and overnighted to the 7 student flight teams for harvesting and analysis. In the meantime the 12 student flight teams for the SSEP Mission 3b Falcon II payload, and 11 flight teams for the SSEP Mission 4 Orion Payload are racing to complete their formal documentation locking in the flight configuration for their experiments. All 23 flight mini-laboratories are scheduled to be delivered to NanoRacks at Johnson Space Center in Houston by December 3, 2013, for payload integration and flight to ISS aboard Orb-1, currently set for launch in early December. You can explore all Flight Operations for M3 Falcon II and M4 Orion on the SSEP Mission 4 to ISS: Flight Phase Operations page. Finally, 6,980 students engaged in Mission 5 to ISS are in the process of writing and submitting an expected 1,300 flight experiment proposals to their communities’ Step 1 Review Boards. Three finalist proposals will then be submitted by each of the 15 Mission 5 communities to NCESSE by 10:00 pm ET, November 25, 2013. The Mission 5 Step 2 Review Board will meet at the Smithsonian National Air and Space Museum on December 3-4, 2013, to select the 15 flight experiments, which will then go through formal flight safety review at Johnson Space Center’s office of toxicology. The Mission 5 Charlie Brown payload of experiments is currently scheduled to fly to ISS in Spring 2014. Make no mistake – this is real science. This is real spaceflight – and the thousands of students participating in the Student Spaceflight Experiments Program are truly part of America’s Space Program. This is STEM education at its best. Through this program – working together – hundreds of dedicated teachers, dozens of communities, and truly hundreds of partner organizations are inspiring the next generation of scientists and engineers. Opportunity: Do you know a community in the U.S. or internationally that might want to be part of this adventure? NCESSE and the Arthur C. Clarke Institute for Space Education are now onboarding communities for Mission 6 to ISS, with program operations starting on February 24, 2014, and flight to ISS in Fall 2014. Contact us.